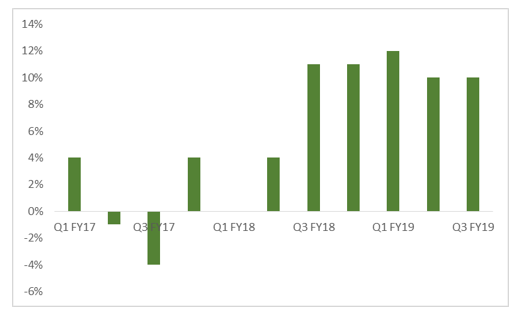 – Domestic sales growth of 13 percent YoY was aided by a volume growth of 10 percent despite a high base of 11 percent in Q3 FY18. – All the three divisions posted near double digit sales growth on YoY basis, making it fifth such consecutive quarter. Since GST implementation, company has displayed a strong agility in bringing its supply chain and product innovation into action. This has benefitted it in capturing any demand led consumption growth and avoiding any opportunity lost due to supply constraints. Additional lever which has helped the company is its investment behind brands and visibility (Advertising cost at 12.4 percent of sales). We are also encouraged by company’s recent M&A deals and expect that company’s emphasis on food and refreshments business could be next strategic growth lever. Having said that there would be a gestation period of 5-6 quarters before a reasonable synergistic benefits accrue.